South African President Cyril Ramaphosa, who took office 11 days ago, announced a sweeping reshuffle Monday that included re-appointing Nhlanhla Nene, who was sacked by Jacob Zuma, as finance minister. Ramaphosa stamped his mark on the presidency with Nene's re-appointment, while David Mabuza, the current premier of Mpumalanga province, was named as the deputy president. Ramaphosa announced 30 changes to minister and deputy minister positions after graft-tainted Zuma was forced to resign by the ruling ANC party earlier this month. 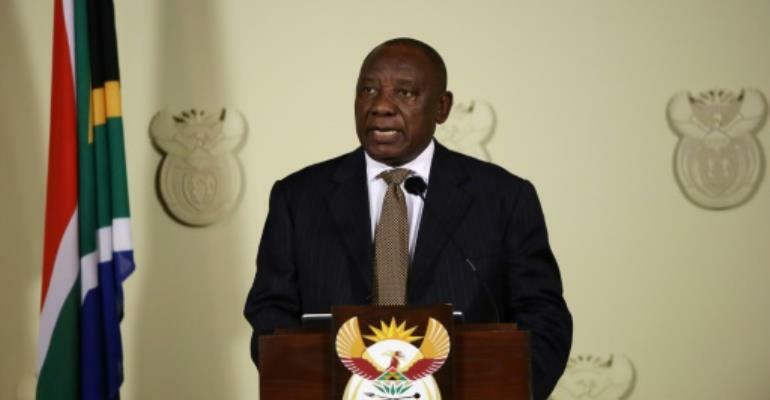 "In making these changes, I have been conscious of the need to balance continuity and stability with the need for renewal, economic recovery and accelerated transformation," Ramaphosa said. Several Zuma allies were demoted or sacked but Zuma's ex-wife Nkosazana Dlamini-Zuma was appointed minister to the presidency, responsible for planning, monitoring and evaluation. Ramaphosa narrowly beat Dlamini-Zuma in a fierce contest to be elected the new leader of the ANC in December. Dlamini-Zuma was seen as Zuma's favoured candidate to succeed him as president, with analysts saying she may have shielded him for prosecution over corruption charges.